Okay, that got my attention. I googled Mr. Thomas—the house was called Huntland (click HERE and HERE for more), and he himself was prominent in the foxhunting world in the land of silver stirrup cups and good English furniture. How he came to have interiors of such imagination, or who did them for him, eluded me, but clearly he was a guy with some dash. 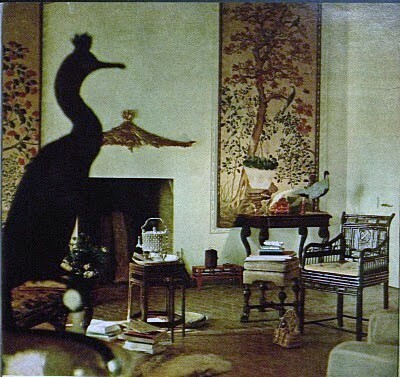 The room seems to be missing from the history of Chinoiserie in America in the 20th century, which includes the Chinese Room at Beauport, not published by House & Garden until eight years after the Thomas Room. 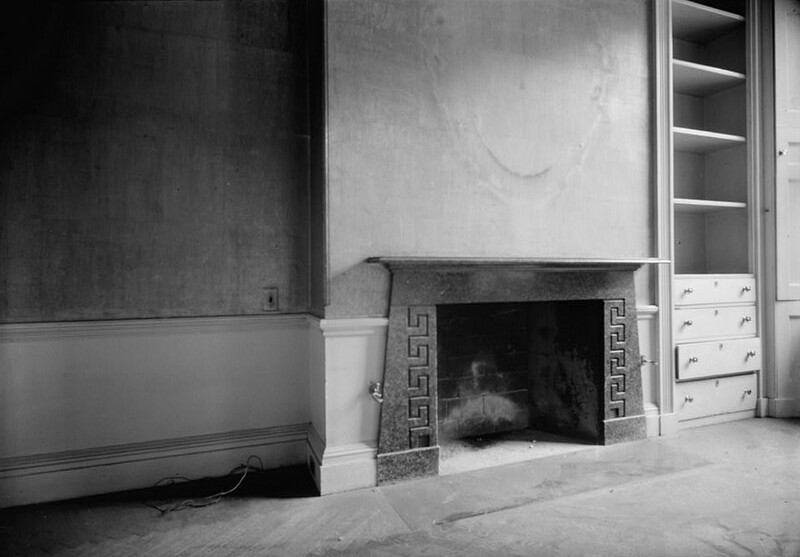 And of course, the Chinese drawing room of 1930 at Henry DuPont’s Winterthur House, whose wallpaper came from the same set as that in the Chinese room in Beauport. The DuPont room is seen below in a stereoview as it appeared when the family lived there, from the Winterthur Digital Archives. 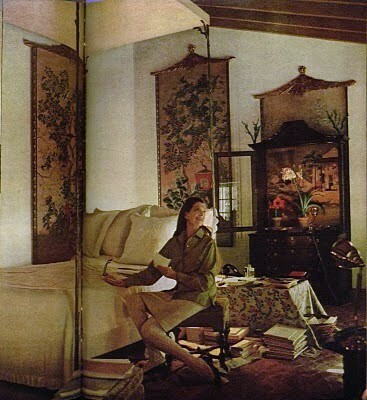 I was tempted to veer off to Middleburg with more about the Thomas house, but instead decided to contemplate some the bedroom’s spiritual descendants, such as Pauline de Rothschild’s Chinoiserie bedroom at Chateau Mouton, as famously photographed by Horst for Vogue, below. Or Nancy Lancaster’s famous bedroom at Haseley Court. 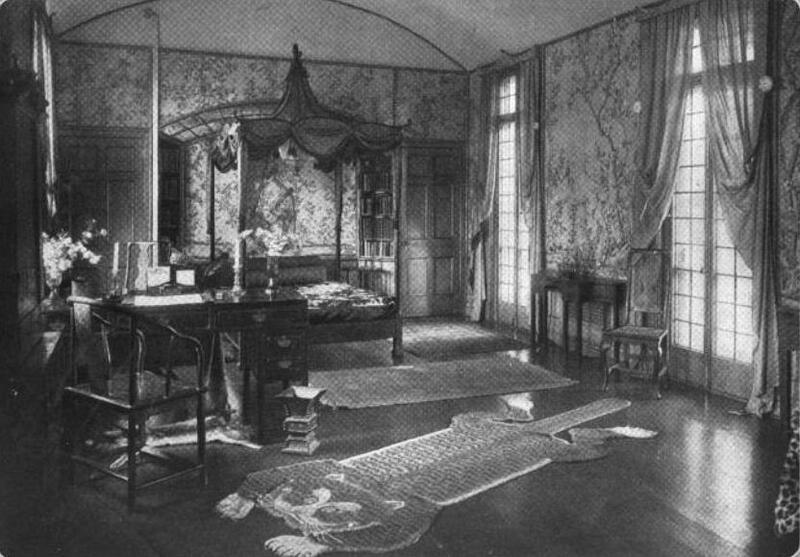 One is tempted to wonder whether Mrs. Lancaster, in her own Virginia foxhunting days as Mrs. Field and later Mrs. Tree, had ever visited Huntlands and seen the glamorous Thomas bedroom. Certainly her famous bedroom there, despite stylistic differences has much in common. Last but not least, the longer I looked at the Thomas room, the more familiar the bed became. 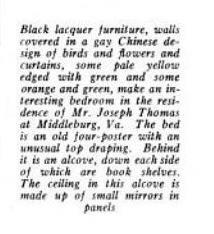 And sure enough it is apparently the same bed for which Doris Duke paid $400.00 at a shop called The Flea Market in 1942, sold for many times that ($20,000 to be exact) at the 2004 Christies auction of her effects. No, seriously, I really did, although undeniably the bar lowers for what can be considered dangerous risk in late middle age. No daring do on ocean sailing boats, no climbing of sheer cliffs. No, what I did was merely park illegally for five minutes and step into the middle of speeding commuter traffic (those suburbanites do love to drive their Audis at inappropriate speed) on Rte. 9 in Scarborough New York. 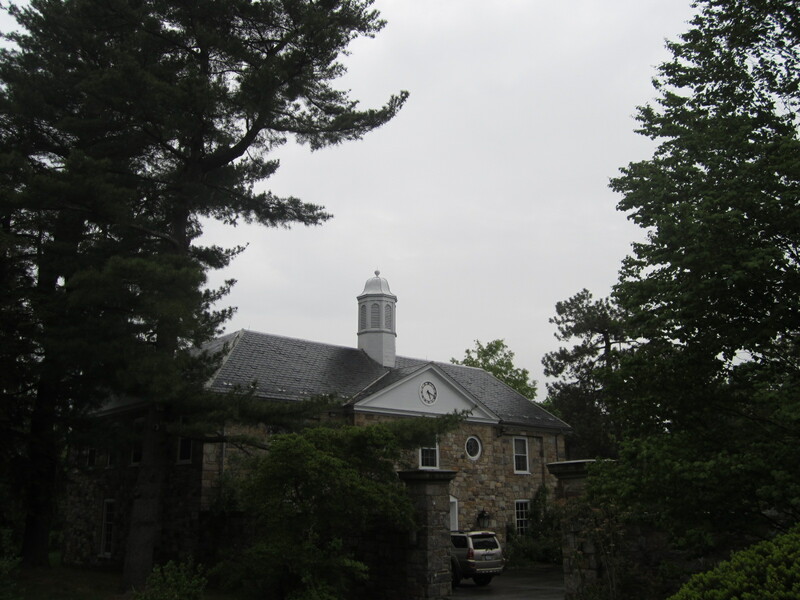 I had to spend three days last week in the Tarrytown region of the Hudson Valley, researching various Maine homes of a family who stuck oil, loaded up their truck and moved to the Hills of Pocantico. The Hudson valley has always been one of my favorite outing destinations, combining as it does world class scenic grandeur, a romantic history and one of the country’s great collections of domestic architecture. 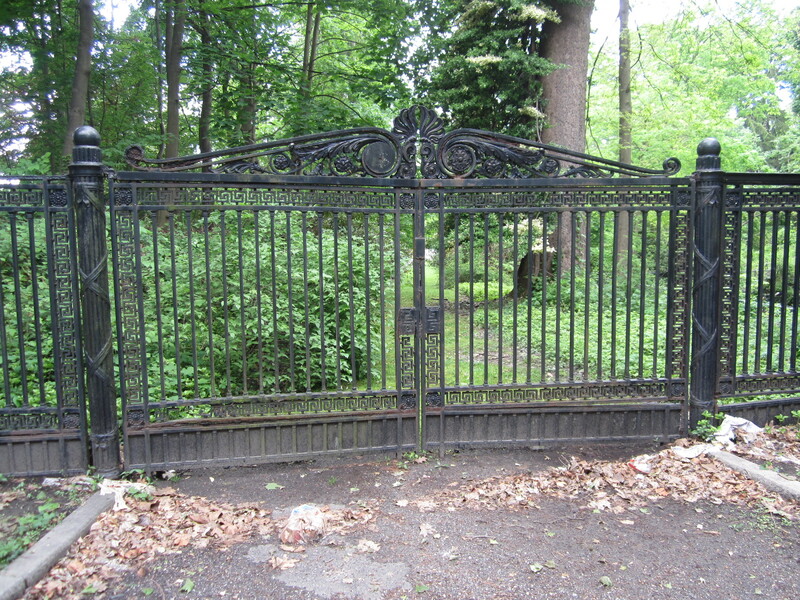 Despite the steady march of Dry-Vit and office parks, the Sleepy Hollow neighborhood around Tarrytown and Scarborough in the lower valley still offers much to see, not the least of which is these dramatic gate on Broadway, as the confusing network of routes 9 are often known on their run up the valley. 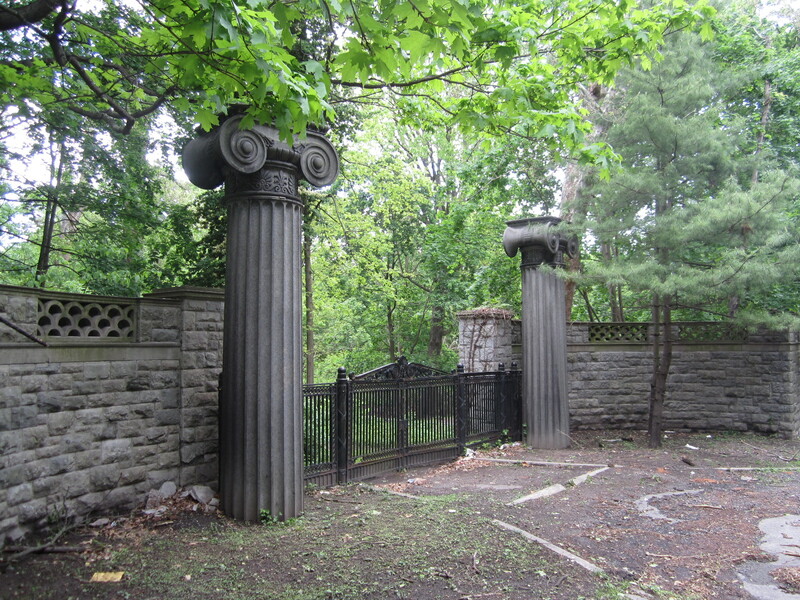 They are the former entrance to Beechwood, an estate dating back to the 18th century. 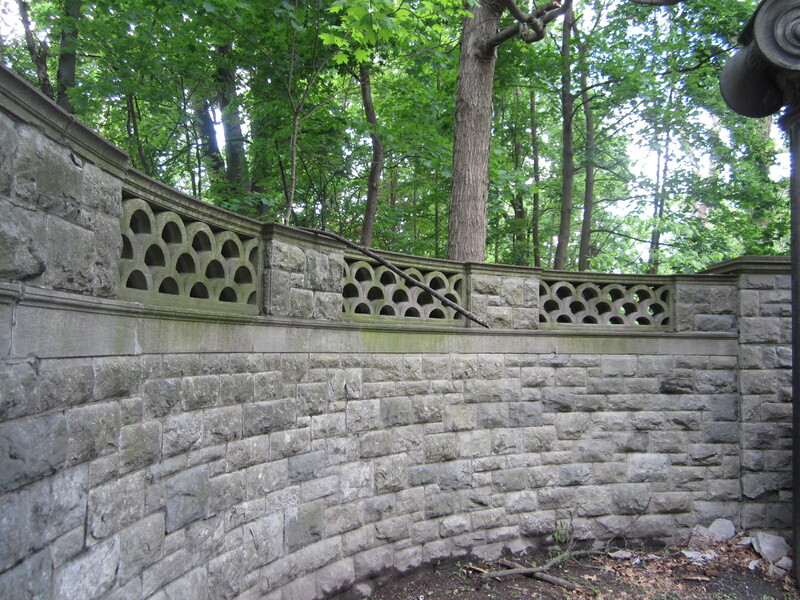 They were commissioned in the early 20th century by the estate’s then owner, Frank Vanderlip, one of the powers behind First National City Bank. His architect was Rockefeller family favorite William Welles Bosworth, a Beaux Arts trained designer with a special talent for cold, cerebral evocations of the drama of ancient Rome and Greece. For the reader who has never passed these gates, it should be mentioned that the scale is imperial. 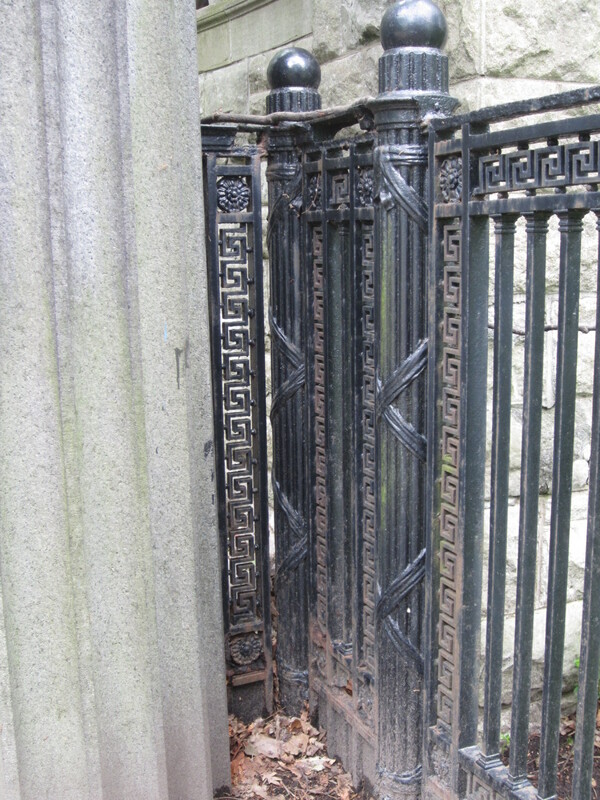 Although the beautiful Grecian inspired iron gate is kept low to increase the dramatic effect, low in the case is actually around feet high at the crest, and the superb columns, rescued from a great demolished 19th century New York building—I once knew which, the answer now eludes me—are well over twenty feet. Mr. Vanderlip must have felt like an emperor, or more aptly, Croesus, when he arrived home after a hard day of counting piles of money. 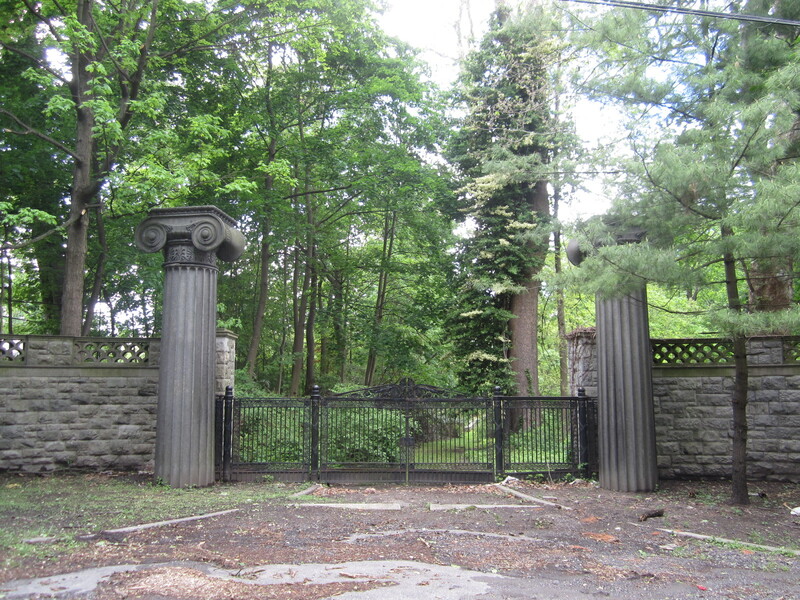 Although the gate is abandoned, the estate itself is condominums, and kept in good order, including the Roman gardens and pool added by Vanderlip, also designed by Bosworth. The house, originally a relatively simple structure built in the 18th century, was repeatedly enlarged through the 19th and 20th centuries, is one of those places where degrees of separation abound. The estate was purchased in the late 19th century by H. Walter Webb, a vice president of the New York central, whose brother, Seward, married the boss’s daughter, whose sister Margaret Vanderbilt Shepard owned the estate across the street by McKim, Mead & White, now the Sleepy Hollow Country Club. Webb’s widow, Leila Griswold, married Edith Wharton’s partner in decorating crime, the confirmed bachelor Ogden Codman, whose first big job had been for Margaret Shepard’s brother in Newport. And so it goes. 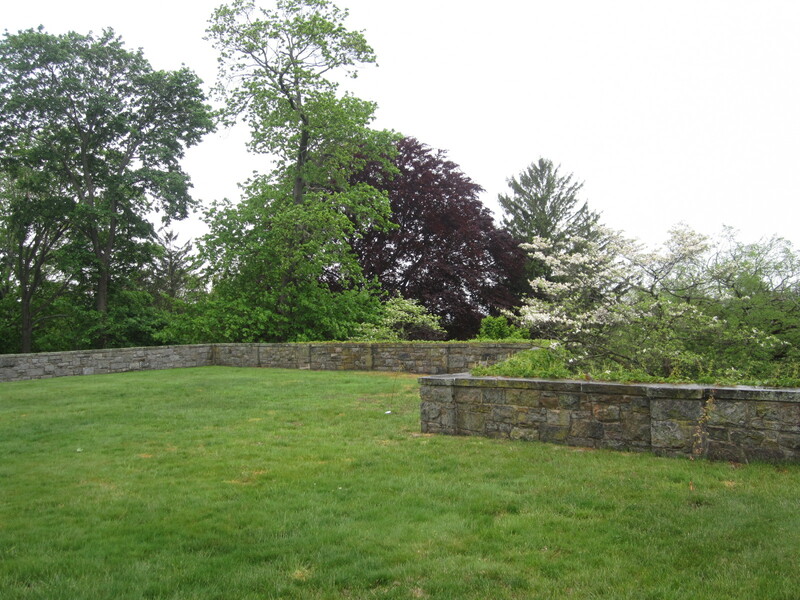 The early Vanderlip years in the 20th century were the estate’s most most glamorous era. Intellectually inclined, Narcisse and Frank Vanderlip built a Montessori school and private theater (above) also designed by Bosworth, on the grounds for their and the neighborhood children. The students later came to include those of John Cheever, who rented a charming studio house on the estate in the mid-20th century (Susan Cheever would return there briefly as a teacher). By the 1970’s, semi-abandoned, the mansion itself became the setting for Merchant-Ivory’s first production, Savages. As with all their movies, the set is the star, and James Ivory’s memory of that shoot (click HERE, pg.7) is worth a read. UPDATE 2: One of the pleasures of blogging is that if I don’t know it, surely a commenter will (thank-goodness). The columns, whose origin I couldn’t remember, were salvaged from the old New York Customs House designed by Isiah Rogers at 55 Wall Street in 1836-42. After the Customs house removed to Bowling Green, the building was taken over by Vanderlip’s National City Bank, remodeled by McKim Mead & White. 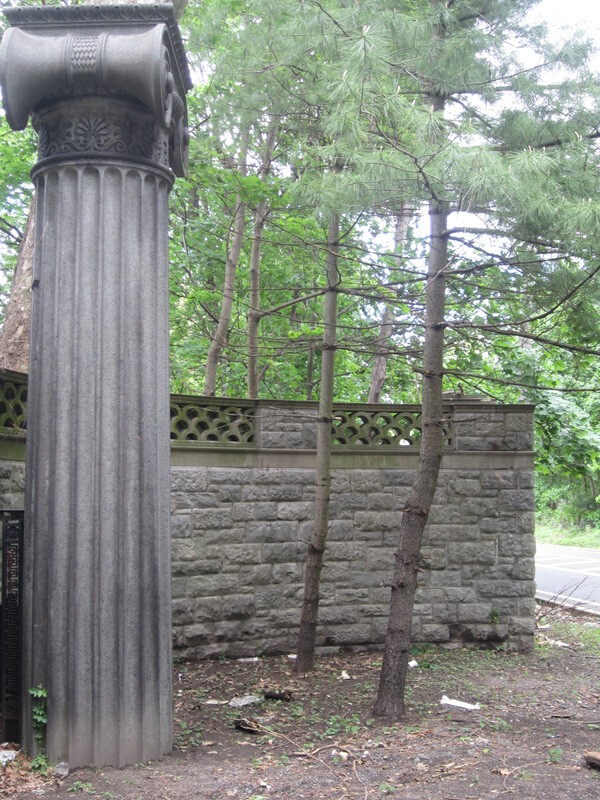 Vanderlip had two of the columns, four stories high and turned from single blocks of Quincy granite Think about what I just wrote. Single pieces of granite. Not the pyramids, perhaps, but a fairly huge engineering feat for the time.. No less amazing is that two stories of the columns’ height is buried below ground in their current location. Darn. 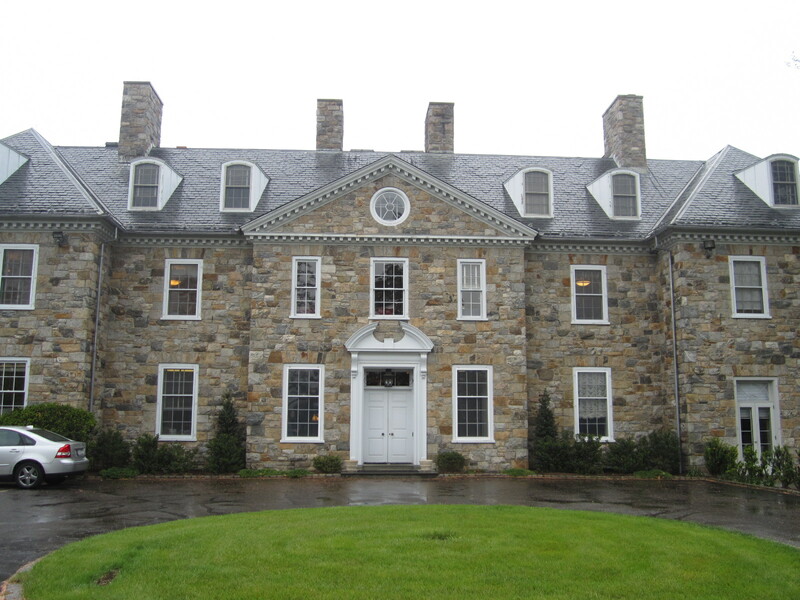 My work requires two days indoors in an old stone mansion high above the Hudson while it rains outside. More later. First, something catches my fancy. 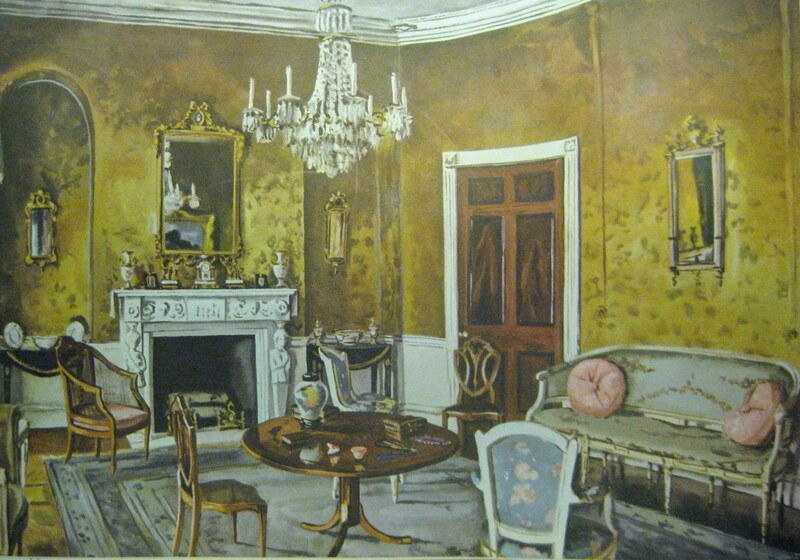 In this case it is a painting by the distinguished interior portraitist, David Payne (1907-1985), of the drawing room in the Beacon Hill town house of Mr. & Mrs. Ronald Lyman. 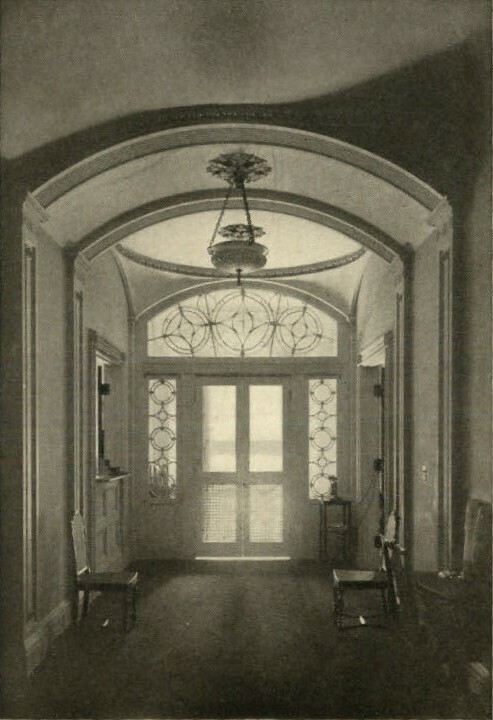 The picture was published in House & Garden’s New England issue–August, 1937, if I remember correctly. I like the room very much—architecturally elegant with its crisp woodwork, curving wall, and beautiful Italian statuary marble fireplace, with caryatids supporting a classical frieze. It is old school New England, stylish and rich, with its Italian sofa, french chairs, damask walls, and at the right, a Bilbao looking glass, no doubt brought back in an ancestor’s ship. 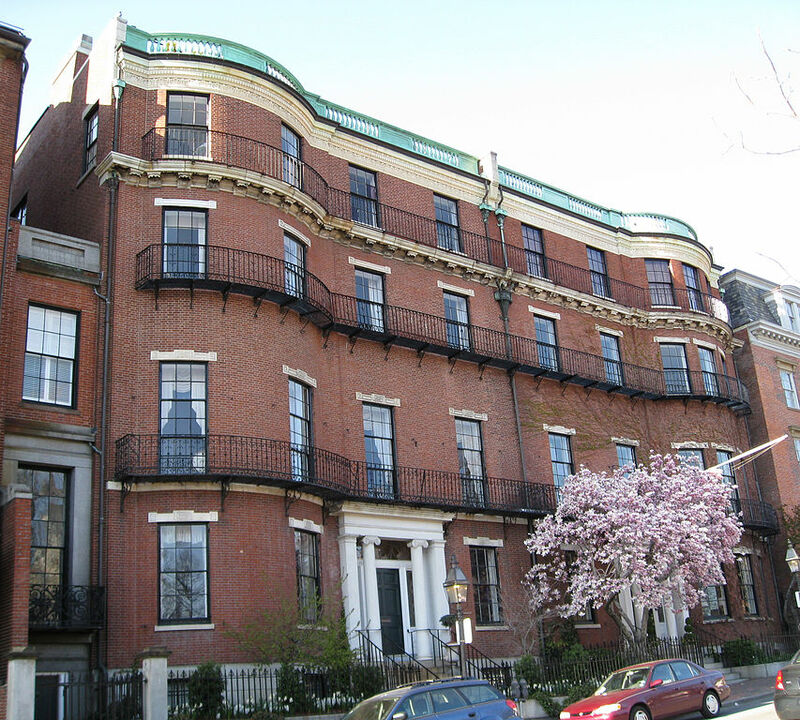 Of course, I then should mention that the Lyman House at 40 Beacon Street is one of a pair of brick bow front townhouses designed by the great Alexander Parris, overlooking the Boston Common. 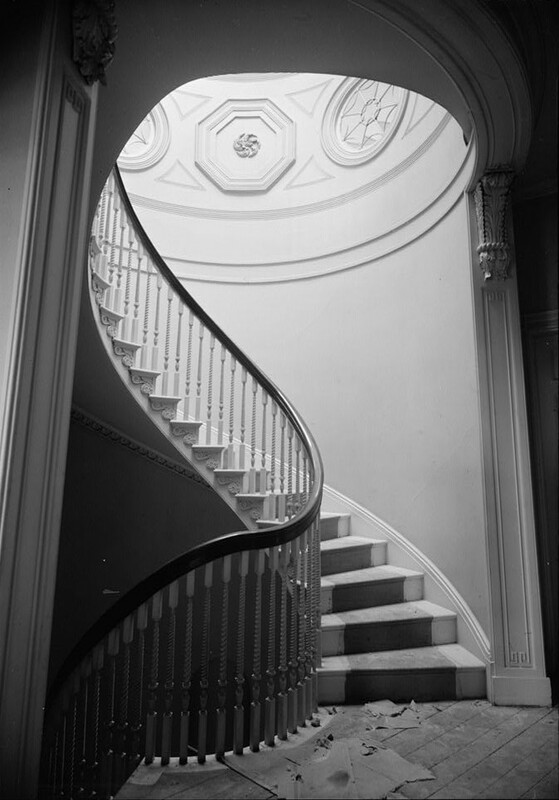 Parris was one of the first New England architects to break out of the box with elegant Greco-Federal designs with oval rooms, curved walls, segmental arched ceilings and other details that gave weight to the aspirations of the early 19th century plutocrats for whom he designed. 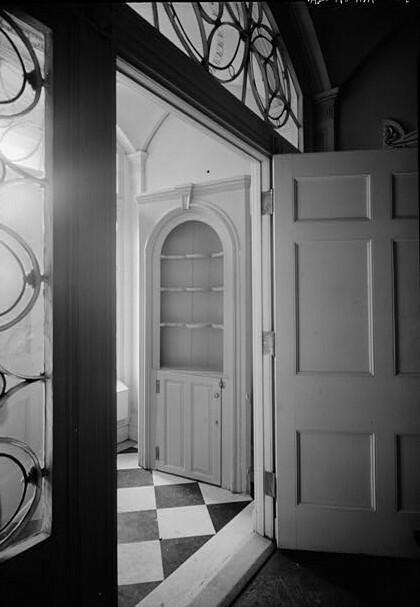 In his interiors one can see forms which Delano and Aldrich would make seem modern all over again in some of their most elegant designs of the 1920’s and 30’s. But already I’m off the subject. It is worth mentioning that the land on which these houses sit was owned in the 18th century by the painter John Singleton Copley. 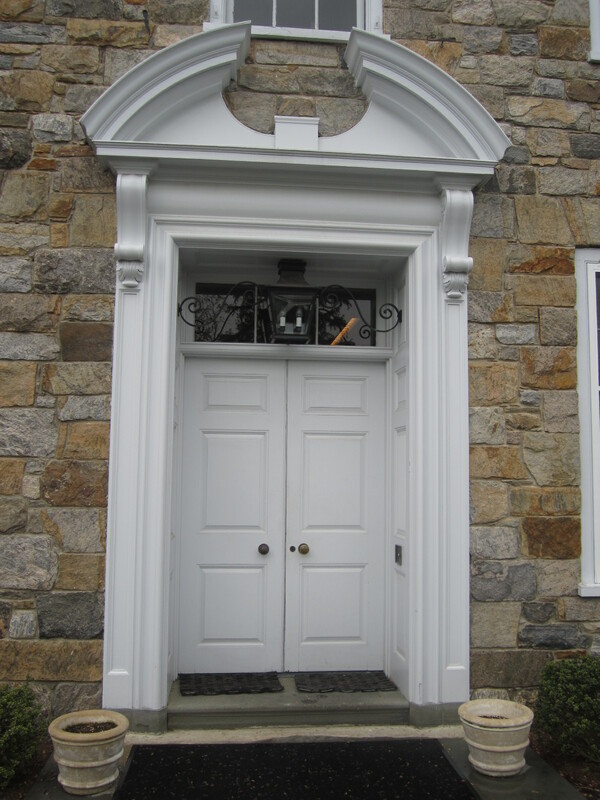 The Lyman house was built for hotelier Daniel Parker, and its mirror twin at 39 for Nathan Appleton, whose daughter Fanny married the poet Henry Wadsworth Longfellow there in 1843. These houses, in what was the finest location in Boston in their day are quintessentially with the elegant bow fronts that define their neighborhood, yet with their long second story drawing room windows , they also recall Regency London, the unruly Common sitting in for an English square. And there the post could end—but of course, it won’t. A fourth floor was added to the houses in the 1880s. 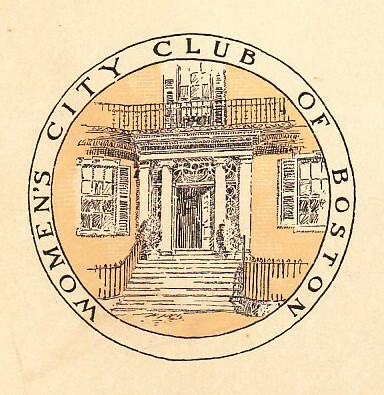 By 1914, the Appleton house at 39 had become The Women’s City Club of Boston. 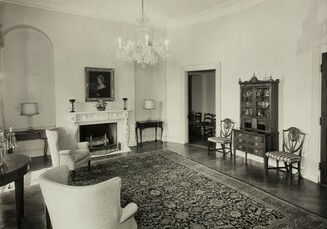 In 1938, just one year after the painting above was published, the Lyman House was purchased by the Women’s City Club and annexed to its neighbor. 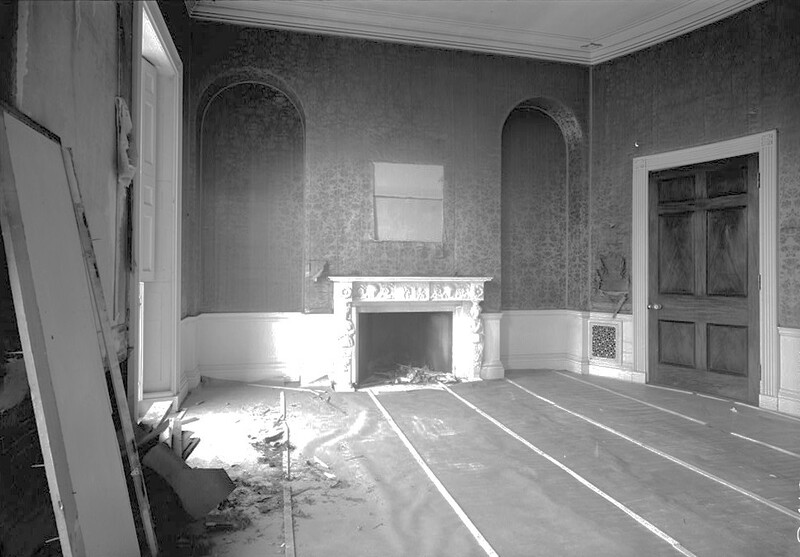 And that same year, the house was recorded for the Historic American Buildings Survey, and a photograph of the drawing room, post-Lyman, its damask wall covering in tatters, was taken as it was being renovated. 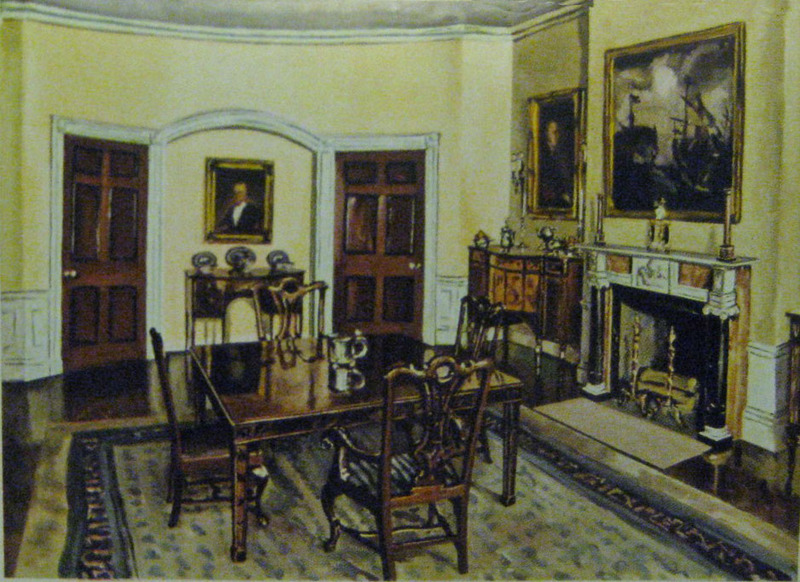 And there too, the post could end, but wait, I found a picture of the drawing room as it appeared in the Women’s City Club era, all bland good taste, very period room, with ‘correct’ furniture and safe decorations—gone is the rich cosmopolitanism of the Lyman era. But one can’t end a post without a picture of the exteriors of numbers 39 and 40 can one? 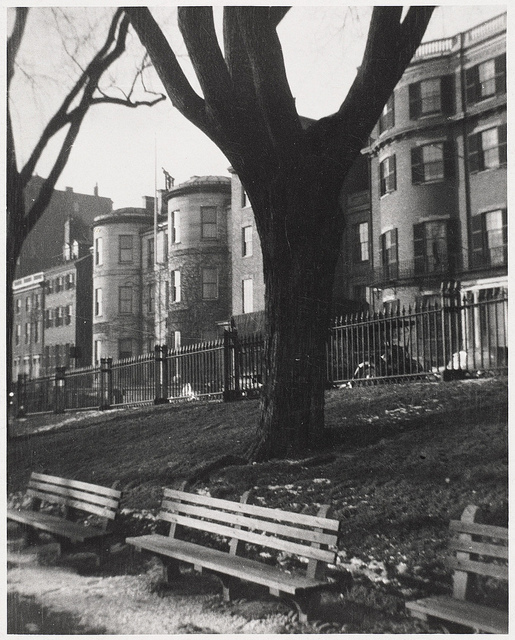 Below is a view of Beacon Street from the Common in taken in 1938. Number 40 is at the right. The gray granite building at left center is the Somerset Club, remodeled from the David Sears mansion, also designed by Alexander Parris, who was also architect of Quincy Market. By this point, I really could end the post, and it would still be of reasonable length, but how can I? For the House & Garden article also included another David Payne painting—of the Lyman’s dining room at Number 40, with yet another handsome mantel, a beautiful Chinese rug, and family portraits. 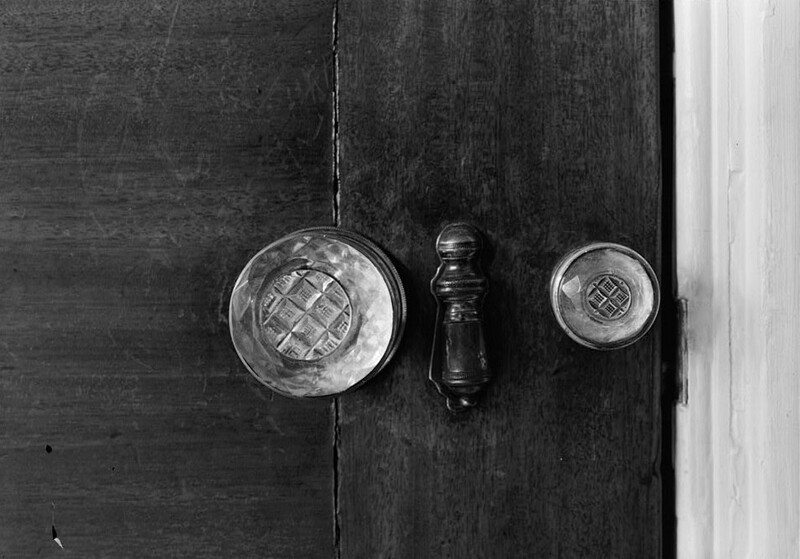 And, in for a penny, in for a pound, I might as well include a photograph from the Historic American Buildings Survey, of one of the beautiful interior hardware of the Lyman House, early 19th century cut glass, either English or American, and notice the beautiful close grain of the Honduran mahogany doors. The hall, with its complex arches and false dome, is as sophisticated as anything of its era in New England, and recalls, to my mind at least, John Soane. 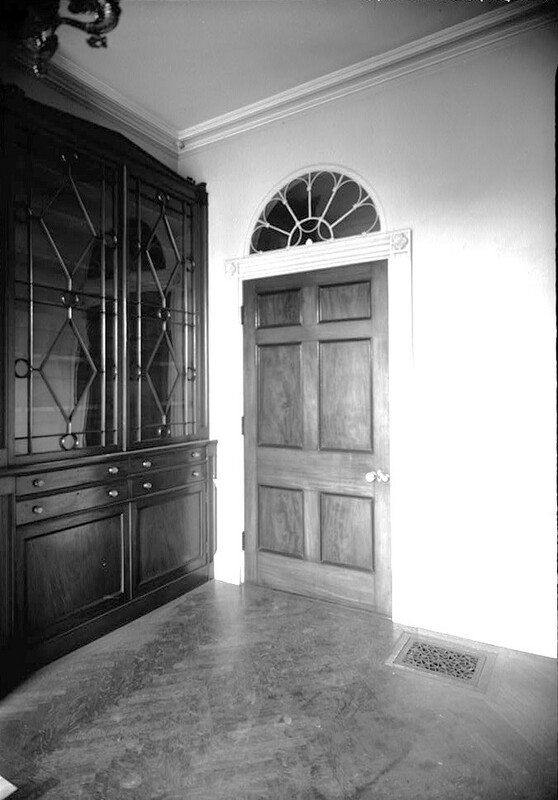 And as few things make me weaker than early 19th century American classical architecture, this view, with elegant interior fan, and built in bookcases by one of Boston’s fine early Federal era cabinetmakers, must be included. 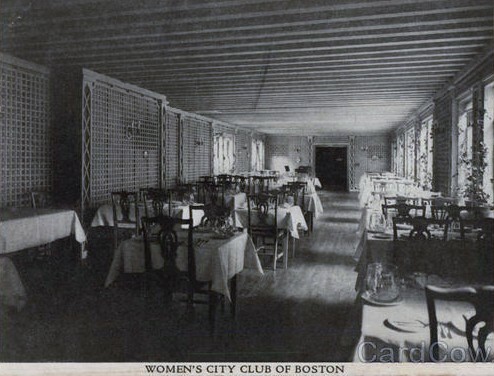 The Women’s City Club, no doubt inspired by the Colony Club in New York, added this trellised dining room, as well as a ballroom and roof terrace. The 20th century history of the two houses is too complicated to unravel on a simple trip through Google—too many writers, especially of the real estate variety, have garbled, joined and confused the separate stories and identities of the houses. Many more photographs of interiors exist for both, but for now I have stuck with the Lyman half of the building—after all, even I have to end somewhere, right? In the early 1990’s, the Women’s City Club disbanded, and sold the twin houses. A developer turned them into condominiums, although four of the five Lyman house units were occupied as a single residence by Jack Welch (yes, that Jack Welch) until he moved back to New York. More recently, the Lyman house has been on the market, selling for 27,000,000, a Boston residential record. And that, kiddies, is how a Dilettante post gets so long. And at that, I resisted the temptation to ramble on about what a pleasure it was to visit the houses back in ’79, when the WCCB opened the house to the public in an attempt to raise funds. Also, I resisted the temptation to include a picture of Alexander Parris, who managed to live long enough to have his photograph made, or of his great work, Quincy Market, and I even almost gratuitously included Gilbert Stuart’s portrait of Boston Mayor Josiah Quincy, just because I liked the depiction of Quincy Market in the background. I also avoided a segue into the story of social progressive Helen Storrow, wife of Boston Mayor James Storrow. It was she who purchased the Appleton House for WCCB in 1914, because I would no doubt have wandered further off track into one of her pet projects, the moving of early American buildings to the Eastern States Exposition Fairgrounds, creating an idealized New England village called Storrowtown, the precursor of many of today’s assembled village msueums from Cooperstown to Sturbridge. And for a brief second I even considered a segue into Daniel Parker’s famous hotel and the dinner rolls that bear its name. But I resisted. So many tangents, so little time.